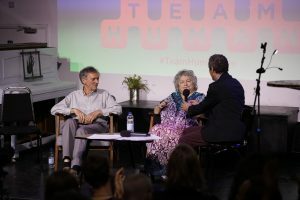 On July 9th 2018 Team Human partnered with Virtual Futures for an evening of connection and conversation at JuJu’s Bar and Stage in London. Joining Douglas on stage, science fiction, fantasy, and horror writer Pat Cadigan followed by biologist, author, and TED outlaw Rupert Sheldrake. Opening the show, Rushkoff digs deeper into his recent, now viral essay, “Survival of the Richest.” Rather than succumb to the notion that the future is something we must insulate ourselves from, what if we both imagined and committed to building a future that amplifies connection and mutual aid? Pat Cadigan is a science fiction, fantasy, and horror writer, three-time winner of the Locus Award, twice-winner of the Arthur C. Clarke Award, one-time winner of the Hugo Award. Recovering American living in North London with her husband, the Original Chris Fowler, and their cats, Gentleman Jynx and the Angel Castiel. Patrons have immediate access to the complete, uninterrupted show with Pat, Rupert, and an audience Q&A. Visit https://www.patreon.com/teamhuman to support the show. A special thanks to Luke Robert Mason for producing this live event. The music you hear is thanks to Dischord Records and Fugazi, R.U.Sirius, and Mike Watt. Live image thanks to Hannah Close. Trading card thanks to Bobby Campbell.